This fantastic washer dryer from AEG combines washing and drying in one convenient appliance, and with no loss of performance. 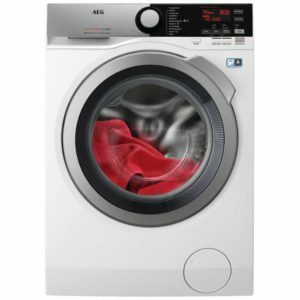 With a 10kg wash capacity and 6kg drying capacity, the L9WEC169R uses Pro Sense technology to tailor the energy use and duration of each load, while its Dual Sense system monitors the drum motion and temperature, for incredible results and care of your clothes. Sensi Dry heat pumps keep the running costs low, and with an A energy rating, you can be sure that it won't cost the earth to power. We love this washer dryer from Miele! It offers a generous 7kg capacity which is perfect for smaller households. This model features a Honeycomb drum which has been specially designed to take care of your clothes. It is slightly sculptured to create a thin layer of water and air which gently cushions your clothes away from the drum. It has a drying capacity of 4kg with sensor drying and timed drying options. 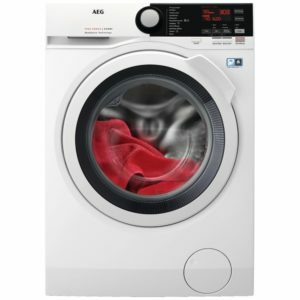 This brilliant washer dryer from AEG offers plenty of performance, and with its 9kg wash capacity and 6kg drying capacity, there's space for plenty of clothes! Each load is taken care of, thanks to features like the ProTex drum and Dual Sense technology controlling the temperature and motion of the drum. The handy Steam Refresh function is perfect for removing creases and freshening up any musty or dusty items. 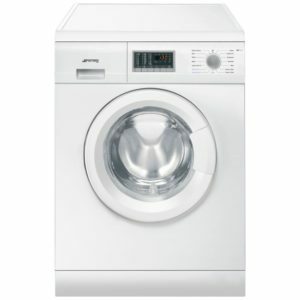 If you're looking for efficiency look no further than the WDF147 washer dryer from Smeg. With an A energy rating and a delay timer function electricity usage will be kept to a minimum. 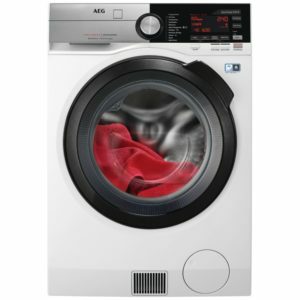 This model features a 7kg wash load and a 4kg drying capacity with a spin speed of 1400rpm. The sensor dry function stops the drying cycle automatically once the clothes are dry. If you're looking for efficiency look no further than the WDF14C7 washer dryer from Smeg. With an A energy rating and a delay timer function electricity usage will be kept to a minimum. 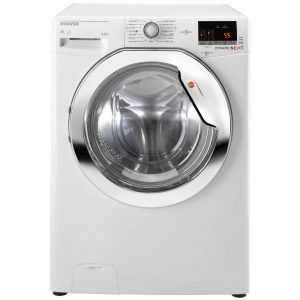 This model features a 7kg wash load and a 4kg drying capacity with a spin speed of 1400rpm. Full of the features that we love Siemens for, this WD14H422GB really offers outstanding performance and clever technology. With a 7kg wash capacity and a 4kg drying capacity, this handy appliance is great for smaller homes. It uses the Siemens iQ Drive, a clever brushless motor for increased reliability and efficiency. It works wonders with its anti-vibration design, A energy rating and great technology including the OptiWash system that gently washes using a cascade of water and Steam functions for crease reduction. 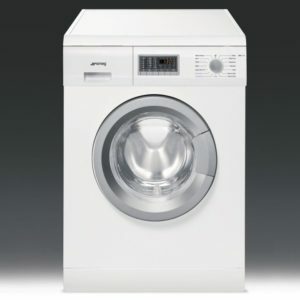 With a useful 8kg wash capacity and 6kg drying capacity, this handy washer dryer from AEG is perfect if you have limited floor space, combining 2 appliances in 1! Not short of features, it has 9 wash programmes to choose from including Steam Refresh, which reduces creases in your laundry and can be used to quickly refresh garments, perfect for when you dig an old favourite out of the wardrobe! AEG's inverter motor is incredibly reliable, and much quieter than traditional motors, with its brushless design. 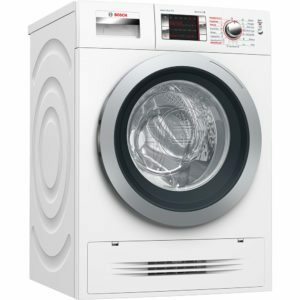 As the L7WEE861R uses systems like the Dual Sense feature, which adjusts the drum motion and temperature for every load, you can be sure that your clothes will be taken care of, right down to the most delicate items. 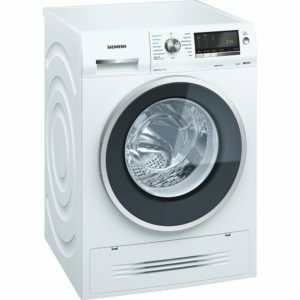 This superb Bosch washer dryer has an impressive 7kg wash load and a 4kg drying capacity. With a 1400rpm spin speed and an EcoSilence Drive this model is extremely energy efficient. 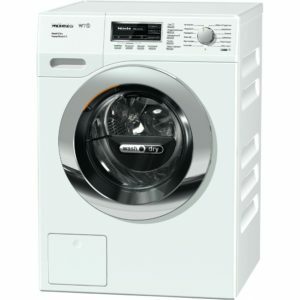 It boasts features like AirCondensation Technology for extremely water efficient drying through air condensation, Refresh function for crease-free and refreshed laundry, HygieneCare wash programme with high dry temperature pre-treatment for hygienic fabric care and AutoDry which gently dries laundry to the exact degree of dryness you require. This model is finished in white and comes with a two year parts and labour warranty. 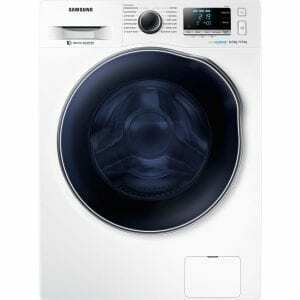 This superb EcoBubble 8kg washer dryer from Samsung is perfect for lower temperature washing and saving energy. The EcoBubble technology delivers powerful cleaning at impressively low temperatures by mixing air, water and detergent to create bubbles, removing dirt easily, whilst protecting fabric and saving energy. This model also features a 59 minute wash & dry cycle. Have your favourite outfits washed and dried in under an hour! Ideal for those last-minute outfit changes before a night out. 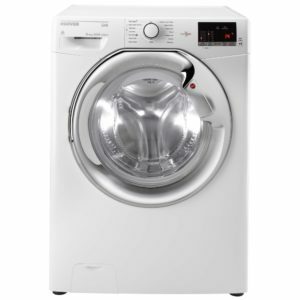 With Air Wash technology which deodorizes and refreshes clothes using hot air, and intense stain removal features, this A rated washer dryer, finished in white, is the perfect washing companion.